Clapham through Time (2015) 96 pages. Alyson Wilson and Claire Fry. 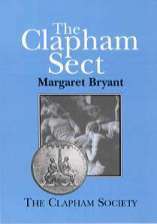 This fascinating book traces some of the many ways in which Clapham has changed and developed over the last century. Clapham Through Time is a selection of photographs of Clapham in the past shown alongside exactly the same views taken in 2015, with a brief historical commentary for each pair. The book records the huge changes in the area in the last fifty years, let alone the last century. Discovering Clapham (2007) 104 pages. 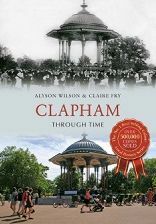 The book starts with an overview of the history of Clapham, setting out how it developed from a small rural village to the bustling part of inner London it is today. The following seven chapters take seven different areas of Clapham, and illustrate a selection of the interesting buildings, giving some background and details to put them in context. Illustrations and information about some notable former residents are included in appropriate places. 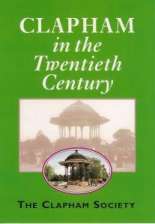 Clapham in the Twentieth Century (2002) 236 pages. A collection of letters, diaries and memories of Clapham during the century, from Graham Greene, Jack Hobbs and Noel Coward to immigrants from the West Indies, Poland and Kosovo, local businessmen, shopkeepers and schoolchildren. In the words of those who witnessed them, the book tracks the changes in Clapham from the last years of Queen Victoria’s reign through two World Wars, depression, revival and gentrification to the lively, popular family area that it had become by 2000. NOW REDUCED TO ONLY £5. 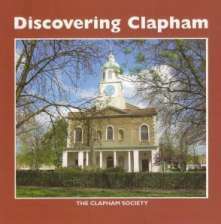 Clapham Walks: Self-guided walks leaflets, each covering a different area of Clapham. Price £1 each, or all seven walks for £5. Alyson Wilson, 22 Crescent Grove, London SW4 7AH. Tel. 020 7622 6360. Email: alysonwilson.sw4@gmail.com Personal callers by prior arrangement. All books are available also from Clapham Books, 120 Clapham High Street, Clapham, London SW4 7UH, at non-member prices. They are happy to order for you as stocks run out.